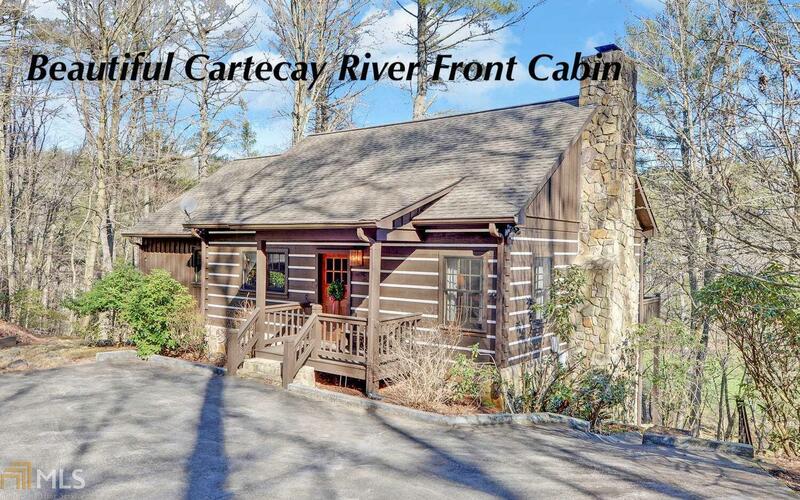 AHHH- MAZING CARTECAY RIVERFRONT CABIN~Enjoy the Sounds and View from this Lovely (One Owner) Cabin Located in the &apos;River&apos;s Edge&apos; Gated Community~ Enjoy 3.68 Acres of Mountain Life and Nearly 250&apos; of River Frontage~This One is Really Special and What You have been waiting for! Stepping Inside this Open Concept Space You will be Awe Struck by the Large Fully Equipped Kitchen with Island~Fantastic Dining Area and Huge Great Room with a Beautifully Rocked Floor to Ceiling Wood Burning FPLC~Wonderful Screened Porch Overlooking the River Below~Main Level Master with Private Bath and Loads of Storage! Downstairs-Is Perfectly Appointed with Two Bdrms/Two Baths~Sizeable Storage Room/Workshop and Laundry~ Den/Office or 4th Bedroom! Too Much to Mention!